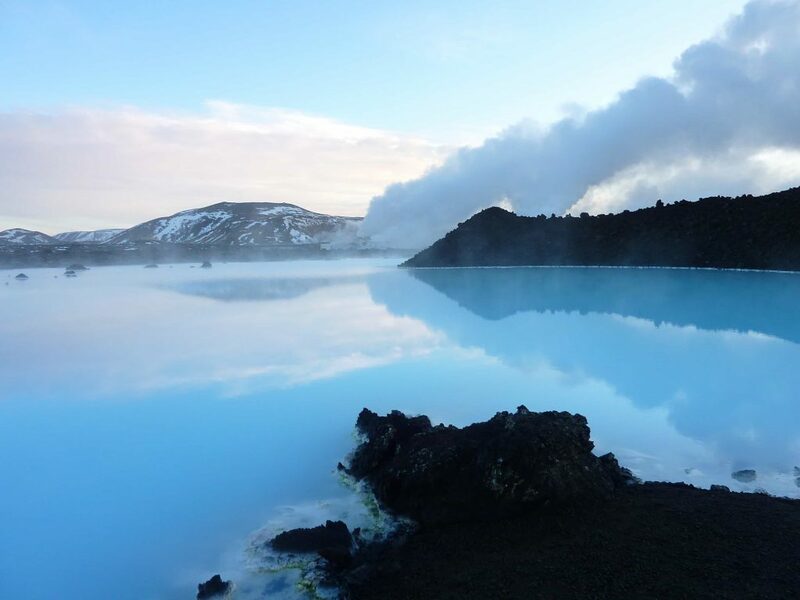 The Blue Lagoon is one of the best things about Iceland, and first-time visitors to the volcanic island won’t want to miss it. 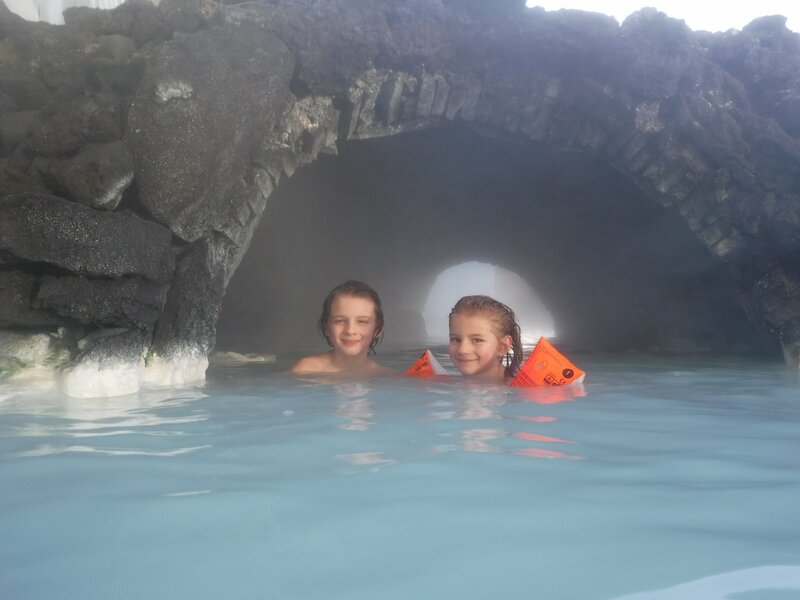 Set amidst an 800-year-old lava field, the exquisite pool of geothermal seawater will soothe and delight even the youngest members of your family. 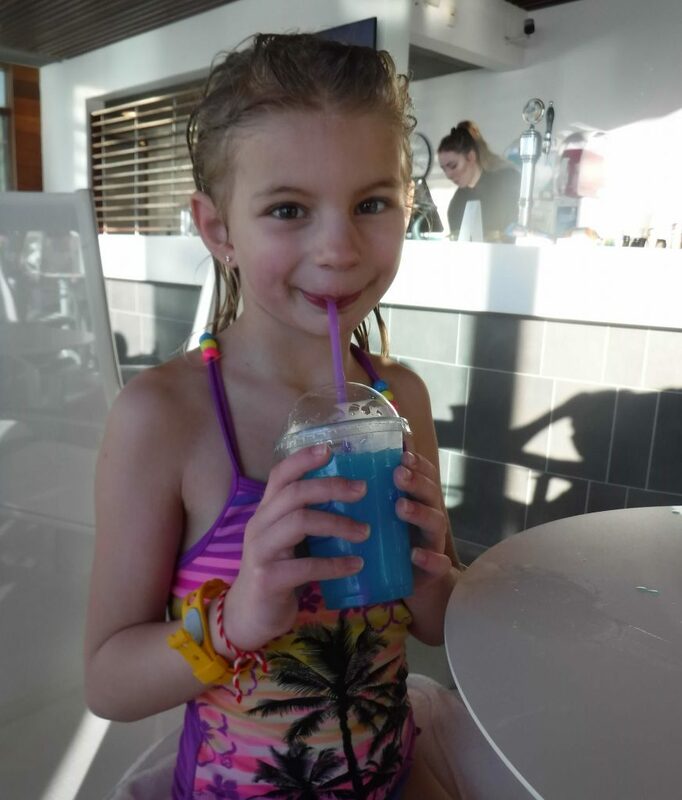 In this guide, we’ll take you through everything you need to know about the Blue Lagoon with kids. Let’s jump in with the best part: children aged 2-13 are FREE with the admission of an adult. Book online in advance, along with your own ticket, and you’re set! Once you’ve arrived and checked in, you’re welcome to stay for the whole day. For safety reasons, there is a maximum allowance of two children per adult, and babies under two are not allowed in the pool at all. The official website says children are not entitled to any extra services, however…. I booked the cheaper Comfort package, and the children and I were each issued a wristband and a towel when we checked in. Further, there is a towel station at the entrance of the pool area where guests can freely trade in their wet towels for fluffy dry ones. From the way it reads on the website, silica is only issued to paying adults, however, it is actually scooped out freely to anyone who swims up to the Silica Bar within the pool. This was a major win with the kids; they loved slathering their little faces with the white mud. Be careful to avoid the eye area, or it will sting. Included with admission is one free drink while in the lagoon. I fully expected to pay for the children, but I was pleasantly surprised when they were each allowed to choose a drink as well. Fifi had a blue slushie and Richie chose a Skyr smoothie. We were even allowed to bring the drinks right into the steamy lagoon with us! The lagoon’s floor is a naturally uneven surface of silica mud, and the pool depth varies from around 3 feet to a little over 5 feet. For safety and peace of mind, children aged eight and younger are required to wear arm floats while in the water. There is a big bin of the complimentary floaties in the entrance area of the pool and children can select whichever ones fit best. You may bring your own, but the silica in the water does a number on hair and bathing suits, so you might want to use what is provided. There are separate men’s and women’s locker rooms, which are stocked with complimentary lockers, shampoo, conditioner (leave it in your hair when you go in the lagoon! ), hair dryers, and even plastic bags for wet bathing suits afterwards. Guests enter the locker room, choose an empty locker and scan it with their wristband to activate and lock it. Proceed to the showers (leave in that conditioner) and then exit to the entrance to the pool. I was alone with two kids – a boy and a girl – and I wasn’t sure how this would work. I asked the friendly staff, and was told my son (9 years old) was welcome to come to the women’s locker room with me and his sister, or he could choose to go through the men’s locker room. We could even request a staff member to accompany him through and help him set up a locker, which I thought was really nice. He chose to go through the men’s locker on his own, and he was able to figure out the lockers with no trouble. If he were any younger or not so confident, it would have been better to have a staff member go with him or I’d have kept him with me. Upon exiting the locker rooms, turn left and you’ll see a door half-submerged in water. You may push the door open and swim right into the lagoon, without having to walk out in the chilly air. I gave each child a waterproof camera so they could take their own pictures inside the lagoon. I secured the ties to their wrists, but one of them still managed to drop their camera. Luckily, they noticed immediately and I was able to feel around with my feet and we found it. The water is opaque and there is zero chance of seeing anything that has been dropped. Keep a close eye on those wristbands too! They’re a little large on tiny wrists, but they seemed to fasten securely and we didn’t have any problems. 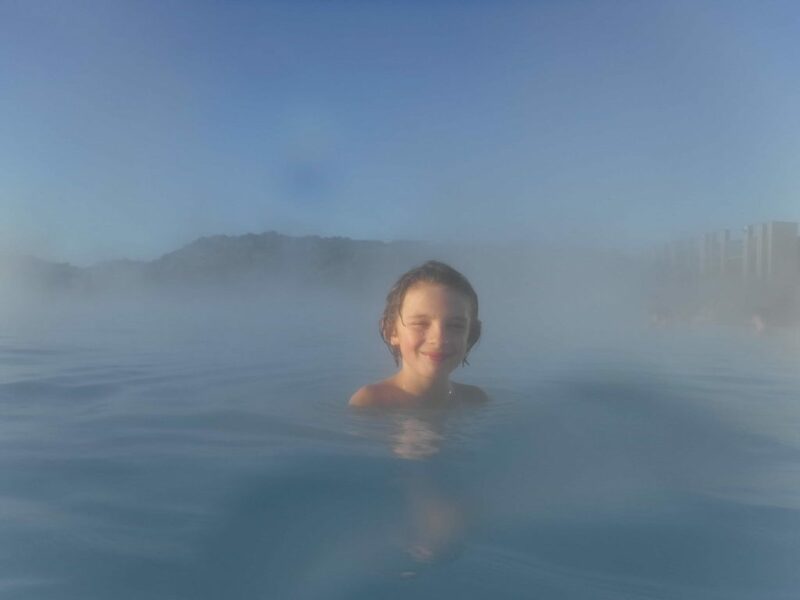 Hopefully this goes without saying, but visitors are drawn to the Blue Lagoon for its peaceful, restorative quality. Boisterous play and splashing are definitely not welcome, and children are asked to be on their best behaviour. The water comes from deep below the earth and picks up minerals on the way to the surface, which gives it the milky white colour (the blue colour comes from the sky). The temperature is usually between 37°C and 40°C depending on the season. The water is self-cleansing, renewing itself every 40 hours. Do not wear jewelry in the lagoon because the water may damage it. Wristbands are issued to each member of your party. These are used for locker access and for any purchases while in the lagoon. Lockers are fairly small, so plan carefully what you’ll bring into the Blue Lagoon with you. The website says children should share lockers with adults, however, their wristbands work to set up their own locker as well. Secure Luggage Storage is available before you check into the Lagoon. The cost is around $5 USD per bag. It’s in a separate building, so check your luggage before entering the facility. The Lagoon Bar, which you can access from the pool in your bathing suit. It’s indoors and carries drinks, smoothies and snacks. There is also a swim-up bar in the lagoon itself. Blue Café, which is near the main entrance. This is a good place to grab a quick bite before you head out. Lava Restaurant: a full service restaurant with a divine menu. I didn’t splurge on this one because I felt the experience would be lost on the kids, however, it looks amazing. Getting there is easy by bus or car. Shuttle buses run regularly between the airport and Reykjavik, and there is a free parking lot for drivers. The Blue Lagoon is about a 50 minute drive from Reykjavik, and 20 minutes from the airport. 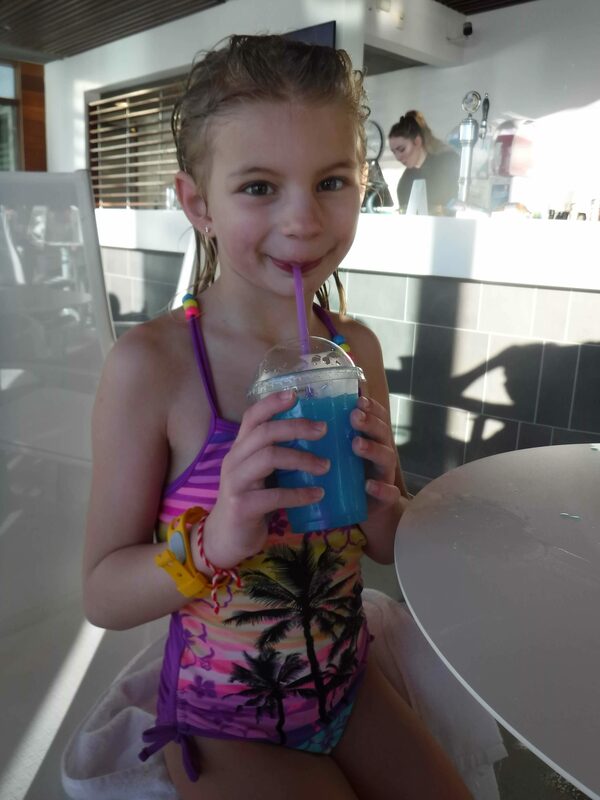 Now that you know everything you need about Blue Lagoon with kids, what do you think? Is it on your bucket list?